Here comes the bride! 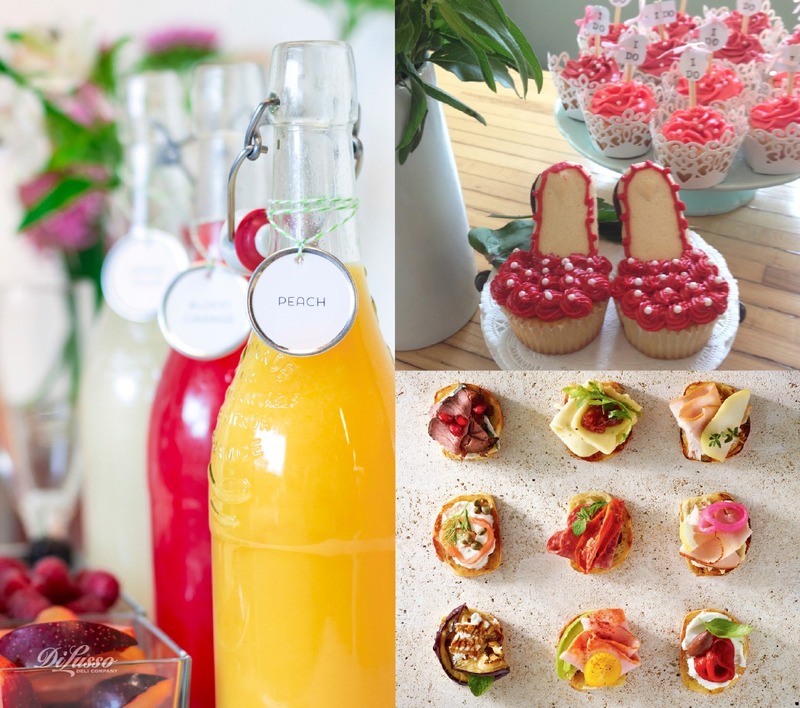 Spring and summer are popular times for weddings, which means you might be planning a bridal shower. We’ve got some ideas for a beautiful shower menu, as well as a few extra tips to make your shower shine. What you serve will depend on the time of day, of course, but we’ve got some recipes that could work for brunch, lunch, or a light dinner. All are festive and lovely to look at, especially when presented on your prettiest serve ware. 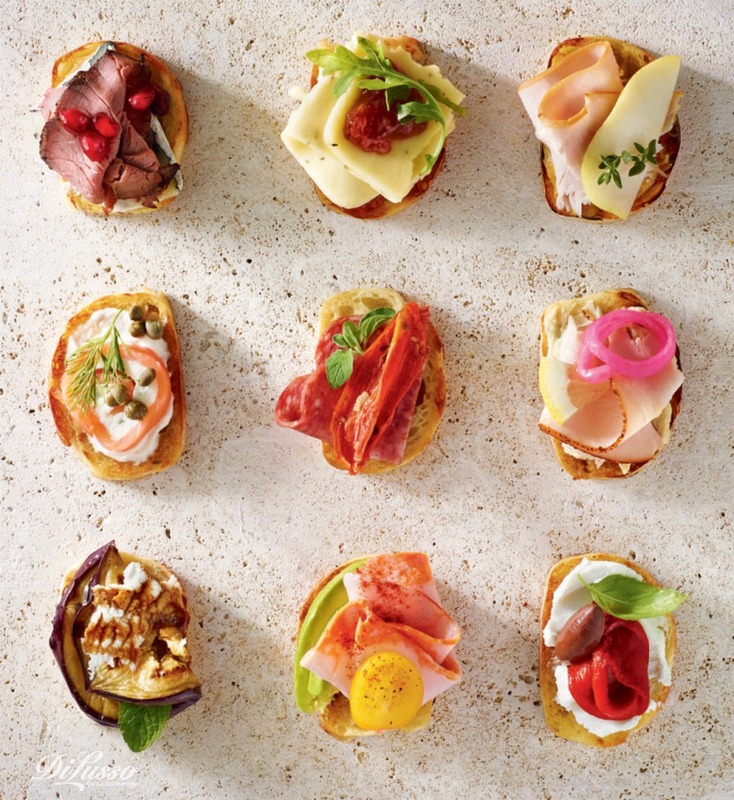 Impress your guests with a beautiful assortment of Global Inspired Tapas—colorful, easy to eat, and endlessly mix-and-matchable with your favorite DI LUSSO® meats and cheeses. 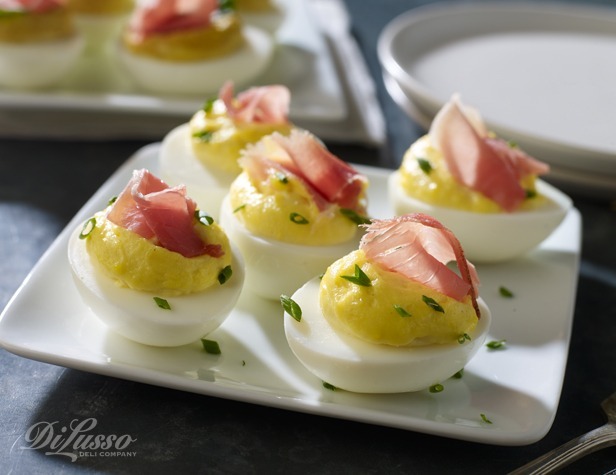 Another pretty finger food for a shower are springy Dijon Deviled Eggs, garnished with a little curlicue of DI LUSSO® Prosciutto and sprinkled with finely chopped chives. And we think our sweet-and-salty Ham, Swiss and Apricot Tartlets are oh-so feminine and dainty. 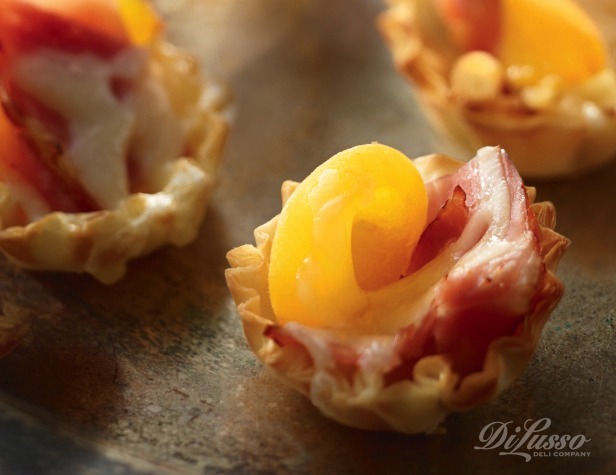 They’re made in delicate mini phyllo cups filled with DI LUSSO® Smoked Honey Roasted Ham and Baby Swiss, caramelized onions and a bit of fresh apricot shining like a jewel. What’s great about all three of these ideas is that no silverware is needed—just little plates and bridal-themed cocktail napkins. Mimosas are a popular girlie drink, light and refreshing. 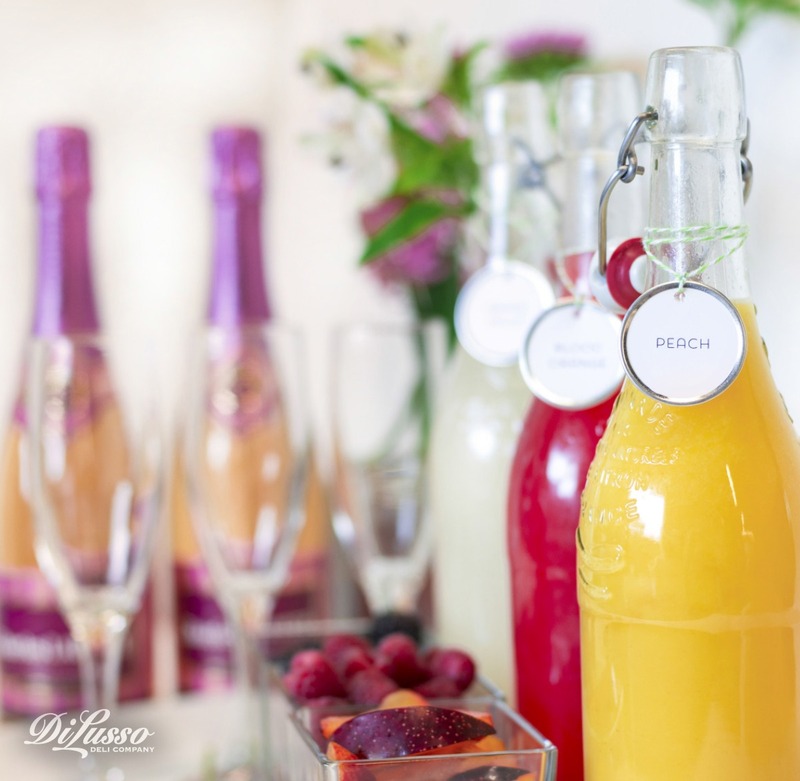 Try a mimosa bar: offer a variety of juices served in labeled carafes to mix with your favorite champagne. Or chill champagne bottles in a party tub—and for an extra-special touch, freeze small flowers in ice-cube trays and add in those frozen beauties with the rest of your ice. You could also tie sweet grosgrain ribbon bows around stemmed glasses, or attach a rosebud or sprig of spring wildflowers. You’ll want a few sweets, of course. Tiny scoops of ice cream served in china tea cups, pastel-colored cupcakes, umbrella- and heart-shaped sugar cookies and candy kisses would be wonderful choices. Send the bride home with her armload of gifts and plenty of best wishes. She’s sure to remember the way you’ve honored her for years to come.